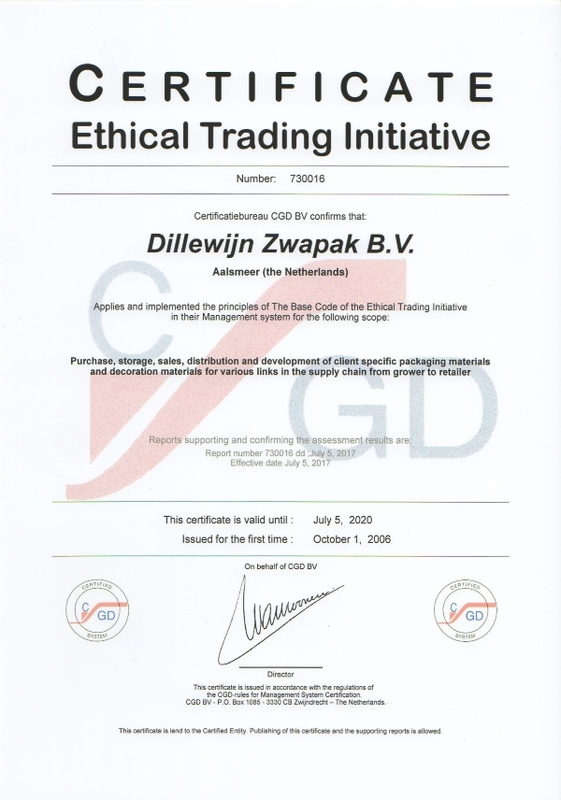 Good news from our partner organization Dillewijn Zwapak: the management and staff of the well-known packaging company are proud to announce that, as of July 5th 2017, their certification by the Ethical Trading Initiative has been prolonged! Dillewijn Zwapak supplies a wide range of quality packaging and floristry products: film, sleeves, sheets, bags, picks, pottery, you name it. The certificate is an important accolade for companies when it comes to sustainability matters, and labour rights in particular. It attests that the rights of workers are properly valued in the entire production process. The ETI initiative is, in essence, about establishing best practices when it comes to ethical trade. The certification thus declares that good business practices underlie the extensive catalogue of products that Dillewijn Zwapak supplies. And responsible and sustainable trade has been a priority issue for Florint, the International Florist Organisation, as well. Have a look at the user-friendly webshop to get a feel for what Dillewijn Zwapak can offer you. The company deliver orders throughout Europe at competitive transport rates. All products are also available in the Dillewijn shops at the Dutch auctions in Aalsmeer (Cultra), Honselersdijk (Pyramide), Eelde (Eurofleur) and Ede (Plantion). Its vision is a world where all workers are free from exploitation and discrimination, and enjoy conditions of freedom, security and equity. > Other recent news that may interest you! Spring jitters at the Green Trade Center in Aalsmeer! Have you already tried the new floral foam trend..? Bart Hassam is the champion of the FTD World Cup 2019!